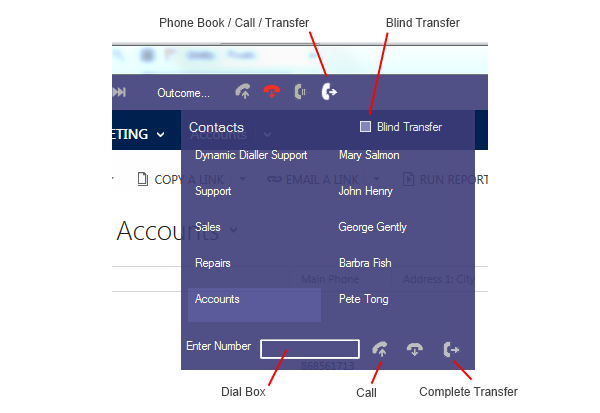 You can use Dynamics Telephony to transfer any call to any destination. For example, you might use Dynamics Telephony to transfer callers to another department or person. Refer to this screen snap and the descriptions below. With a call active on a Call Tab, move your mouse over the Phone Book icon and then down to the Dial Box. Enter the phone number to call and either press Enter or click on the Call button beside the Dial Box. The caller is put on hold automatically. When the third party answers, click Complete Transfer to complete transferring the first caller to the third party. If you decide not to complete the transfer, you can go back to the caller by clicking on their Call Tab and then clicking the Hold / Resume icon on the toolbar. With a call active on a Call Tab, move your mouse over the Phone Book icon and then down to a contact and click. The caller is put on hold automatically. When the contact answers, click Complete Transfer to complete transferring the first caller to the third party. In the previous examples, if you first check Blind Transfer then, when you initiate the call to the third party, the caller is transferred to that third party without further action.